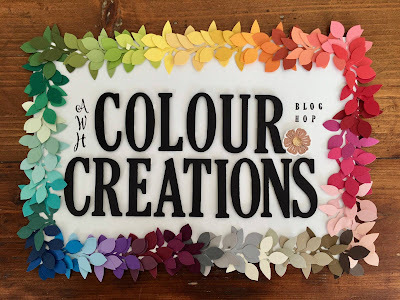 Hi Everyone, Here we are at week 27 of the colour creations hop. This week the colour is Mango Melody, what a lovely colour even though I don't like mango's. I have made this card for my friend Frances whose Birthday in on the 17th December, and as she loves flower and has such a green thumb I thought she would like this one. 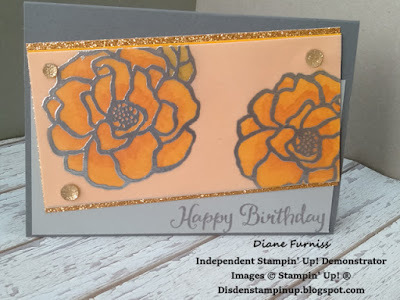 I decided to start with a Basic Gray card base and added the Slate Gray as my first layer I then added 3 more layers to the front of the card in Copper Glimmer paper, Mango Melody and Vellum. I used the Beautiful Day Stamp set and stamped the flower using versa mark and Silver Embossing powder. Then coloured in the flower using the Mango Melody Blender pens. I placed the Vellum layer of the Mango Melody layer using glue dots and place the 3 layers on an angle to add to the feature. I placed the faceted gems over where the glue dot were so that you can't see them, and stamped the Happy Birthday on the gray layer using Basic Gray ink. 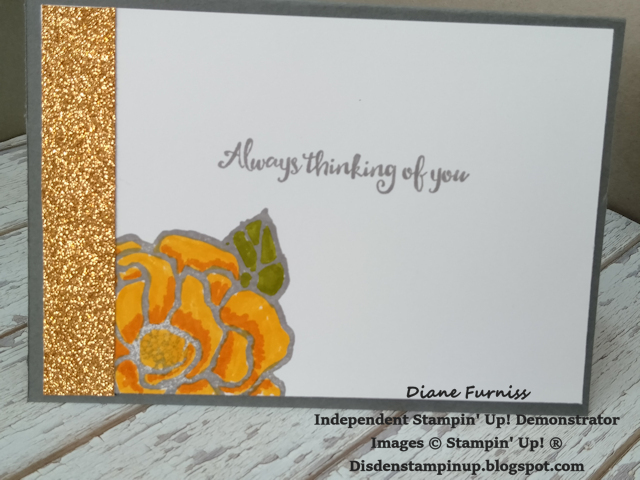 For my insert I used Whisper White and stamped the flower again along with my sentiment and then used my marker pens to colour in the flower. I added the strip of glimmer paper to finish it off. 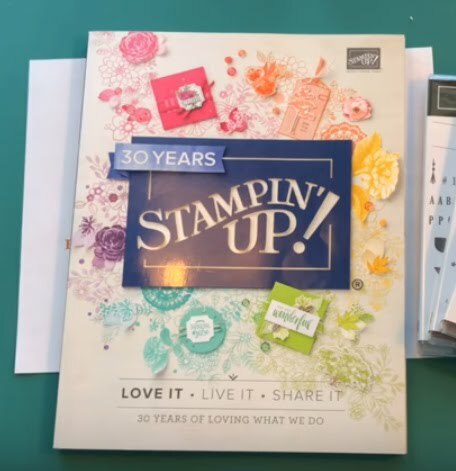 All the items used in the project can be found in the 2018 - 2019 Annual Catalogue Except for the Copper Glimmer Paper that is found in the 2018 Holiday Catalogue that ends on the 2nd January 2019. If you would like to purchase any or all of these items please phone or email me so that I can help you. Lovely card Diane. I have always been a fan of yellow and grey. Love it with a touch of glitz! Great colouring, layers and angles. I love the use of the vellum to soften the colour, Diane, lovely card. Wow, that flower looks great coloured in Mango Melody! I'm sure your friend will love her special card.